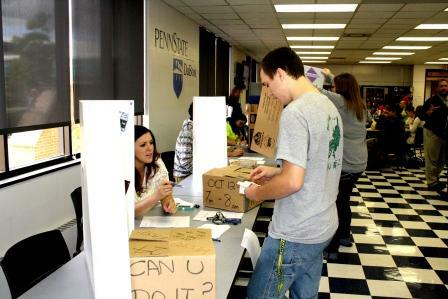 DUBOIS – The Club Fair held this past week at Penn State DuBois gave students the chance to learn about more than two dozen student clubs on campus and provided the opportunity for new members to sign up. Current club members set up tables in the Student Union, where they displayed information about their club. Campus clubs range from recreational organizations to service organizations dedicated to helping others and the community. The diverse variety of clubs offers extracurricular involvement for almost any interest. The fair is a one-stop venue where club members can get the word out about their organization, and where students who want to become involved can take the first steps to do so.